Place flour in a large resealable plastic bag; add beef and toss to coat. In a large skillet, brown beef in oil. Transfer to a 5-qt. slow cooker. Stir in the broth, onions, tomatoes, wine and seasonings. Cover and cook on low for 7-8 hours or until the meat is tender. During the last 30 minutes of cooking, stir in the raisins. Serve with couscous if desired. Freeze option: Freeze cooled beef mixture in freezer containers. To use, partially thaw in refrigerator overnight. Heat through in a saucepan, stirring occasionally and adding a little broth if necessary. 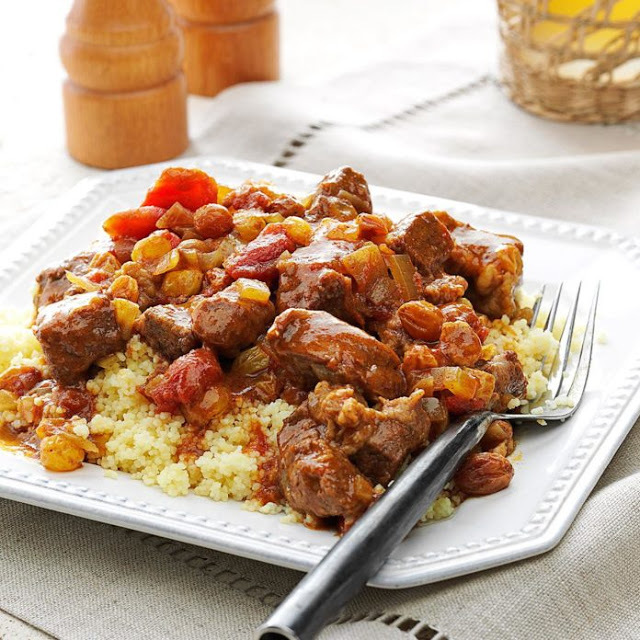 1-1/3 cups beef mixture (calculated without couscous) : 533 calories, 22g fat (7g saturated fat), 98mg cholesterol, 620mg sodium, 45g carbohydrate (30g sugars, 5g fiber), 34g protein.